My favorite artificial to use with spinning gear has always been a topwater. 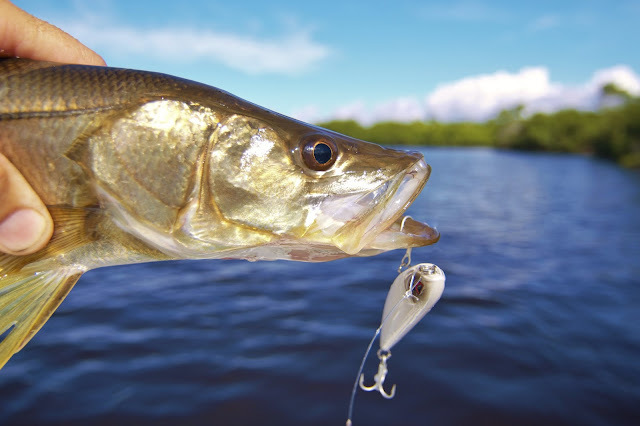 There's nothing more exciting than watching a big gamefish blow up underneath a lure worked across the surface. My first choice has always been the proven Zara Spook but I've recently tried out the new Flats Walker made by FlatsHQ, a local SW Florida based company. I've wasn't too surprised that the lure drew a lot of strikes since almost any well designed topwater will attract a hungry snook. What did surprise me was how easy the Flats Walker was to work and how relatively weedless it ran. These are two things this lure does better than older Zara Spook, which takes a bit of skill to swim properly and grabs every piece of grass it encounters. 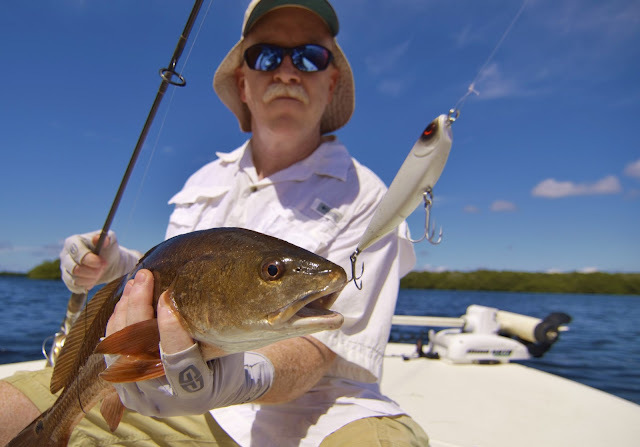 The Flats Walker sits a little lower in the water and has a more subtle action but still pulled the snook and reds right out of the mangroves. It also has some very substantial hooks that never bent in the least on any of the fish we landed these last few days. You can order these online direct from FlatsHQ's website or find them locally at the Snook Hut in Cape Coral. They're only $6.99 so pick up two. Beavertail Skiffs Open House, Ruskin, FL.